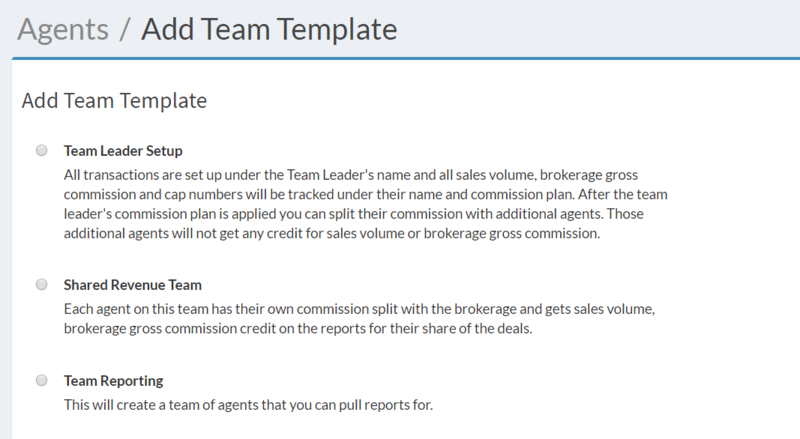 Team Leader Setup- All transactions are set up under the Team Leader's name and all sales volume, brokerage gross commission and cap numbers will be tracked under their name and commission plan. After the team leader's commission plan is applied you can split their commission with additional agents. Those additional agents will not get any credit for sales volume or brokerage gross commission. Shared Revenue Team- Each agent on this team has their own commission split with the brokerage and gets sales volume, brokerage gross commission credit on the reports for their share of the deals. Team Reporting- This option allows you to create a team of agents specifically for pulling reports on that team's performance. Choose the commission plan you would like assigned to the team leader for the specific team structure. To add the additional team members click on Add Team Member and choose the agents name, the percentage the second agent will receive, and what the percentage should be based on. Brokerage Gross Commission-If you choose Brokerage Gross Commission we will take a percentage of the gross commission and pay this agent that amount out of the Team Leader's Commission. Or Agent Commission-If you choose Agent Commission, we will take a percentage of the agent's commission and pay this agent that amount out of the Team Leader's Commission. You can continue to add additional agents to the team structure. Click preview to show an example of how your splits will work and confirm they are figuring how you would like them to. The preview feature will always use a $10,000 commission to show you the estimated breakdown. When finished click Save and your team leader plan is set up. Choose a team name and select the first agents name from the drop down menu. Choose the commission plan you would like assigned to the first agent for the specific team structure. If based off Brokerage Gross Commission-We will split the brokerage gross commission on the transaction between all the team members. If based off Agent Commission- We will first split the brokerage gross commission with the first agent listed using the commission plan they are assigned to. Next we will split the agents commission from the first agent between all the team members. To add additional agents to the transaction click Add Another Agent. Select the second agents name and the commission plan you would like assigned to the second agent for the specific team structure. Choose the percentage you want this agents commission to be split- this will update as additional agents are added to the team. Choose if you want it based off of Brokerage Gross Commission or Agent Commission. When finished click Save and your Shared Revenue plan is set up.